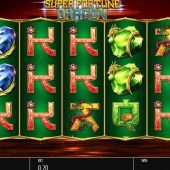 Super Fortune Dragon slot is a pretty basic game unlike Blueprint's other Oriental slots Red Dragon and Lion Festival but at least it comes with a significant variation as we shall discover. The reels are over a background consisting of a room in a temple and are festooned with lamps and I don't need to describe the music you will hear when you play as you will have heard a versions of it on every Chinese-themed game you've ever played. What remains to be seen is whether the promise of the title can transfer to our bankroll or not. We get stacked symbols and no Wilds or scatters which may sound a bit depressing initially until we learn the game mechanic. There are 10 paying lines and all wins pay adjacent, in other words 3 consecutive similar icons will pay anywhere on a win line for example reels 2, 3 and 4 or reels 3, 4 and 5 as well as the first three. Our subject here is gems and the Diamond is highest at 50x bet for a 5-of-a-kind and then Ruby at 40x, Emerald or Sapphire at 30x with five card values at either 20 or 10x for the full line. This may sound pretty boring but you have a chance to play on a grid of 4 slots after getting any win of 4x bet or more! This may remind you of WMS and their Gems Gems Gems slot but we can choose how to spend this cash! If you get the basic 4x bet in the base game then this will buy one Action Spin at 1x multiplier which spins all 4 reel sets. If you get 8x bet you can have two spins at 1x or one spin at 2x multiplier which doubles your cost. These reels also have a stacked Mystery Dragon symbol on them which reveals one icon when the spin stops on any of the 4 slots. You can only have 5 spins in one go before any wins are totalled and you can either collect or 'reinvest' your money in more Action Spins. You don't have to use the Action Spin at all, just collect your base game winnings but you automatically get the option screen when winning 4x bet or more. The top pay of 500x bet for a screen full of Diamonds could be doubled in the Action Spins, so it may be worth considering.